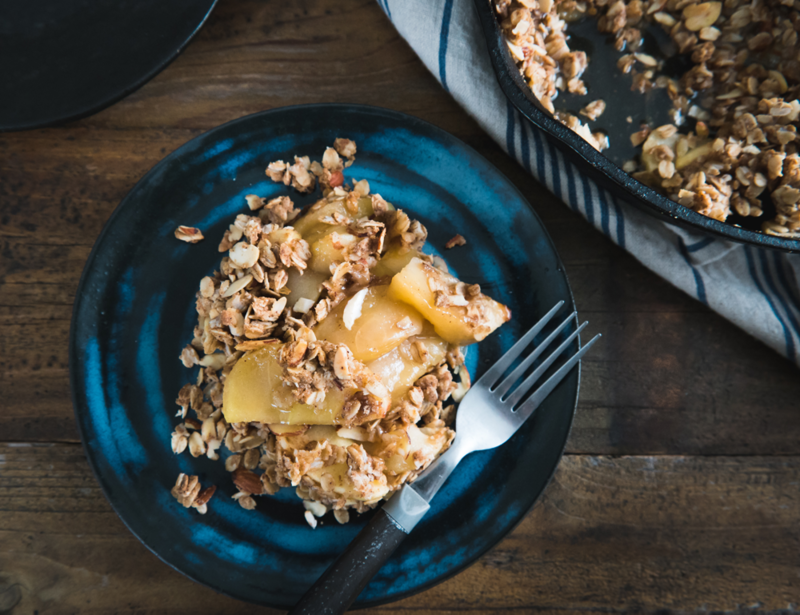 Fight the winter blues with our cozy, warming and wholesome oaty apple crisp that uses multiple varieties of apple to create a well-rounded dessert. The topping delivers some crunch and is filled with heart-healthy oats. 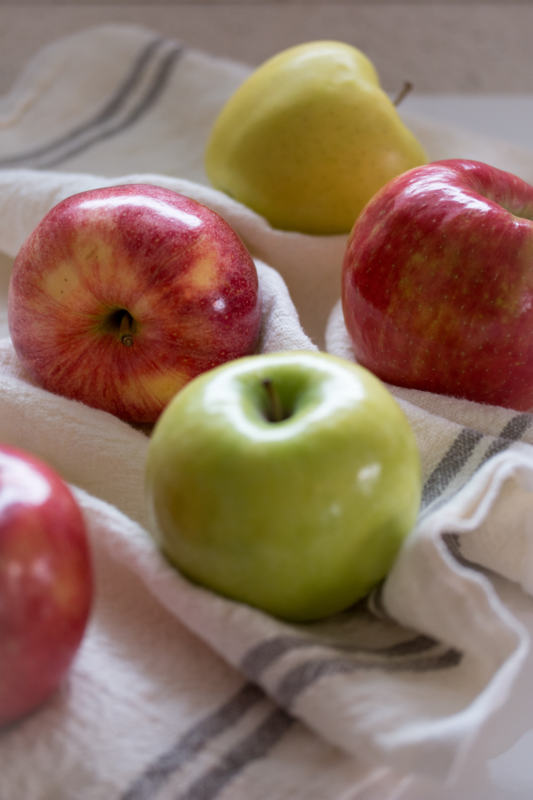 Mixing and matching apples in a single dish makes for more interesting flavors and textures. For example, a soft-fleshed apple like Golden Delicious will melt and add a softer texture than firmer apples like Fuji, Honeycrisp or Gala. Meanwhile, tart apples like Granny Smith bring an acidity that contracts well with sweeter apple varieties. Have some fun with it! Preheat oven to 350°F / 180°C. Grease a 10-inch cast iron skillet or an 8×8 inch square baking dish and set aside. In a large bowl, toss the apples with the brown sugar, lemon juice and cornstarch. 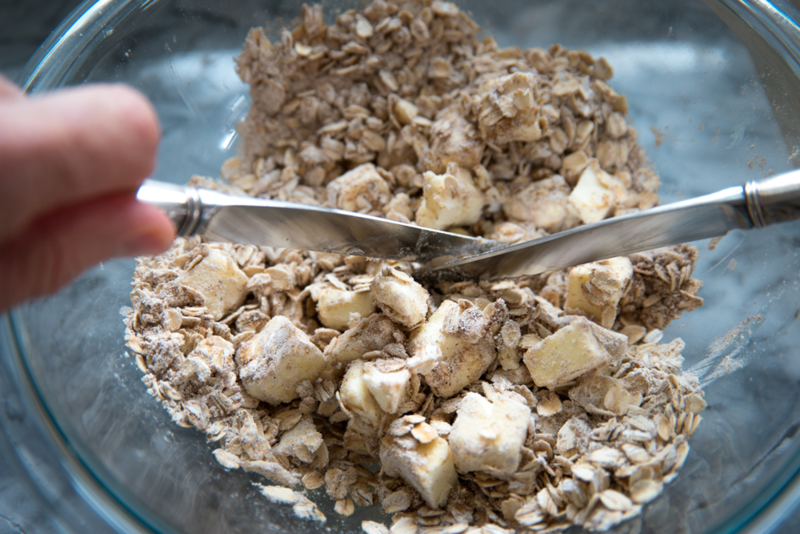 In a separate medium bowl, mix together the rolled oats, oat flour, sliced almonds, cinnamon and sea salt (if using). Add the butter (or vegan butter) and maple syrup. Using two butter knives, cut the butter into the oat mixture. Continue until no large lumps of butter are visible and the oats have formed into small clumps. If you prefer, you can use your fingertips to mix the butter into the oats. Pour the apple mix into the skillet or baking dish and even out. Sprinkle the crumble topping evenly across the top of the apples. Put the crisp into the oven and bake for 45-50 minutes, or until apples are completely soft and the crumble is golden brown. This recipe is best served straight out of the oven with a side of vanilla ice-cream. SugarBee® Apple: Meet the Growers! This one is as tasty as it is beautiful. GREAT RECIPE!